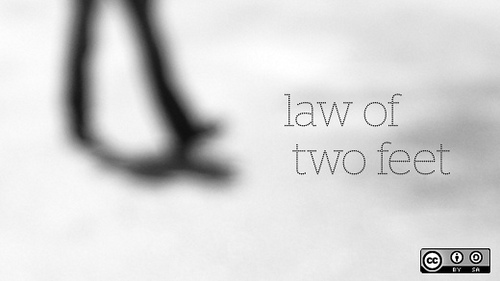 I’m making a declaration – The Law of Two Feet will apply to all aspects of my life for the entire month of November. 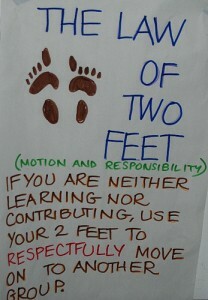 I learned about the Law of Two Feet at my first Podcamp (now called TechPhx). 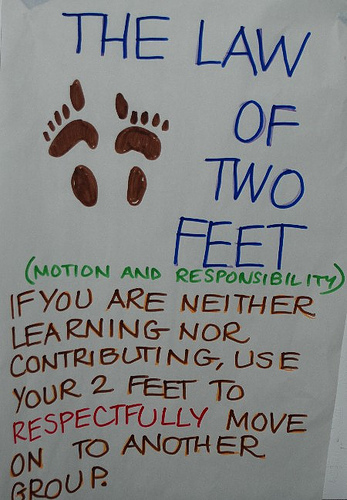 At this unconference, it is perfectly acceptable to leave in the middle of a session if your needs aren’t being met in the session you’re sitting in. The responsibility is on you to get your needs met and to take action if that’s not happening. Over the past few weeks I’ve found myself in situations where I realize 10 minutes into a meeting or an event that it’s not what I thought it was going to be and there was no benefit or point for me to be there. I wanted to leave, but I didn’t know how to excuse myself without feeling like I was being rude. This month I’m going to figure that out. If I feel like my presence at a meeting or event was unproductive, I’m going to take myself somewhere else. This is going to be like an assignment I got when I was taking improv acting at Jester’z. For a week we had to act on every impulse we had as long as it wasn’t going to get us fired or arrested. I was a 3L at the time so that week I walked out of meetings, wrote weird things on white boards, and randomly sat on tables. This is going to be fun. Feel free to join me in this endeavor and let me know how it goes! What happens when you can’t find anywhere more productive to take yourself? Where are you going to go? I’ve had similar impulses as a grad student. I’m not thrilled with one of my classes, and while I don’t have any guilt in abandoning something that isn’t valuable to me, I feel that offering the professor the support of not leaving the classroom outweighs anything I would realistically do “better” with my time. I’m paying thousands of dollars for this experience and trying to get the most out of it, whether in in-class instruction or relationships with professors. If something is a waste of time, there’s always some place more productive to be. I had similar experiences as you in law school. I went to class just to learn what the professor thought was important so I could predict what was going to be on the final. I was paying about $1/minute to sit in class, which is more than what I usually pay for a concert ticket. I wanted the academic equivalent of glitter, fanfare, and dancing girls, and I was disappointed when a professor didn’t deliver that caliber of a class. During a 2-day continuing education course, I launched out of my seat at (an hour into the next five) and sat on the floor against a wall…ahhh. Context: I had much better sensory input which was all I needed to illicit an increase in concentration on something I was interested in although had no attention span for in a chair and desk. This is not the first time nor the last time I will seek what my body needs even when I want to be there cognitively and physically.